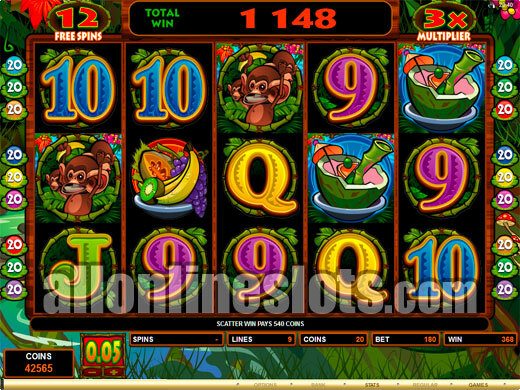 Queen of the Jungle is a Microgaming video slot with an adventure theme and several bonus features. 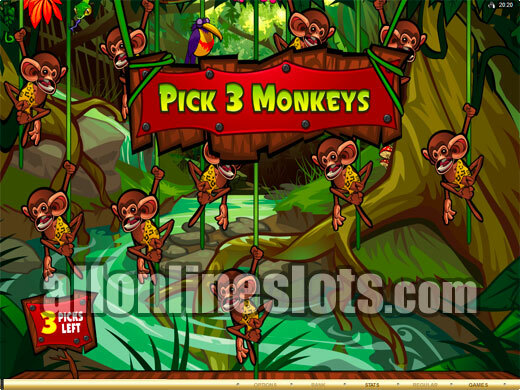 Win free spins or have a shot at one of the three animated monkey features where you can win up to 127 times your total bet. 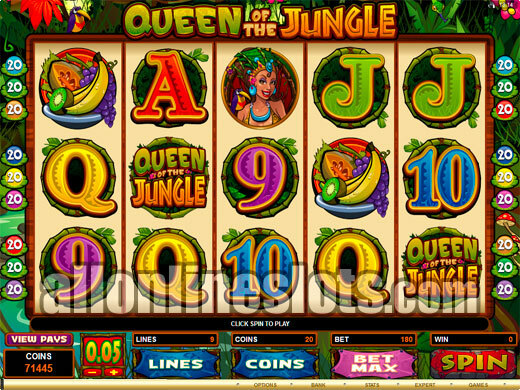 Queen of the Jungle is a 5 reel, 9 line video slot with a jungle adventure theme. It has three bonus features which include free spins as well as a trio of pick a box style features. Top jackpot on the base game is 3,000 coins and you can win up to 127 times your total bet on the second screen bonus games. The game offers a wide range of bet levels with coin sizes starting at 0.01 and going up to 0.50. You can also select to bet between 1 and 20 coins per line which gives you a 180 coin max bet or a 1.80 to 90.00 max bet range. On the reels the Queen of the Jungle logo is wild and substitutes for everything but the scattered monkey symbols and the scattered fruit bowls. Line up five of the Queen of the Jungle logos and you win a big 3,000 coins or 60,000 coins at max bet. After the top line win for the wild symbols there are some other good pays including 1,500 coins for five of the jungle ladies, 1,000 coins for five of the Jungle men (Tarzan perhaps?) and 750 coins for five of the fruit plates. Five of the A through 9 symbols pay between 150 and 50 coins and make up the lowest of the five of a kind wins. The first bonus on Queen of the Jungle is free spins. To win the free spins you need to get three, four or five of the scattered fruit bowls on the screen. You then win 15 free spins with all wins tripled. As usual five scatters also awards a big win which in this case is 200 times your bet or 36,000 coins at max bet. During the free games the top jackpot for the wild symbols increases to a big 180,000 coins. The free spins can be re-triggered an unlimited amount of times which is always good to see. Get a re-trigger with five scatters and you win a big 108,000 coins which is the games second highest possible jackpot. Pick one gift from none choices. You have the option of picking again up to four times if you are not happy with your win. This bonus is like the feature on Jackpot Party. You get to keep picking coconuts to chop until one does not chop. Each pick awards an instant prize. You get to pick three moneys out of the ten on screen. 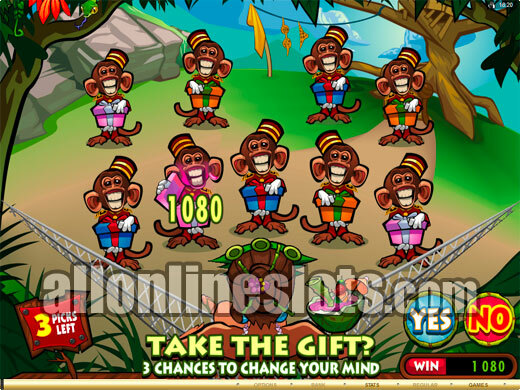 Each monkey awards fruit and more importantly a coin prize. The top pay on all three of the bonuses is 127X your bet or a total of 22,860 coins. Seeing as this is the same for all three you can choose the one you like best. 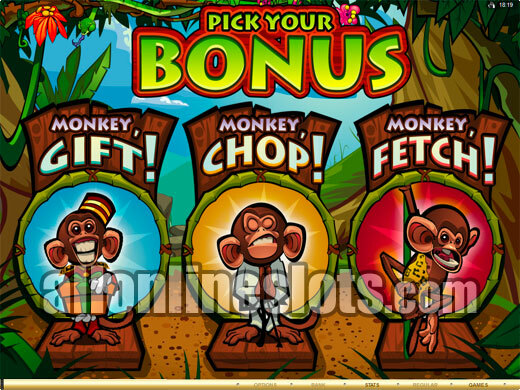 Our choices are the Monkey Gift and Monkey Fetch as the Monkey Chop can end in one pick if you pick badly. Queen of the Jungle is another great game from Microgaming. It has some great jackpots on the reels and the various bonus features make it an exciting game to play.